What is a wedding attendant role? It can get quite stressful thinking about who will be the best person for the job, especially when you don't want to hurt your friend's feelings. What I am hoping by showing you what the individual roles are, is to make it easier for you. When you are getting married, you want to have the people you love, involved and close to you during your special day. This is where wedding attendants come into play. There are several different roles such as Best Man, Maid of Honor, Bridesmaids, Groomsmen, Flower Girl, and Ring Bearer. Each has their own role and it is a good idea to choose the person who you feel fits best, and who you know would want to be involved. Maid of Honor or Best Woman - this is your closest girlfriend and somebody who you want right by your side through all of your planning and on the day. Your Maid of Honor will be the one holding the train of your wedding dress (if you have one) and will also be the one to take your bouquet from you during your wedding ceremony. Nowadays Maids of Honor will quite often make a speech on your wedding day too. Bridesmaids - gather your female friends, sisters and soon to be sisters-in-law to be there as your bridesmaids. The more pairs of hands you have to help you with your wedding day the easier it will be! Plus it is more fun. Choosing what they are going to wear can also be a lot of fun and doesn't have to expensive, here are my top tips to save you money on your Bridesmaid dresses. Flower Girls are special. They add a big cute factor to your wedding day and it will be one of the biggest days of their lives. They will remember this probably forever. Their roles can be to throw petals before you walk down the aisle, to carry a little sign "Here comes your bride"
Best Man - This is the guy who will normally be the witness at the wedding. He is eighteen years of age or older and has the ability to sign a legal document - the marriage certificate. He will be standing beside the groom and sometimes has the duty of holding the rings while the ceremony takes places - if you do not have a ring bearer. He is also usually asked to make the payment to the person conducting the ceremony and make the first toast. A best man is also responsible for organizing the batchelor party or stag night and more often than not is also one of the speech givers on the day. 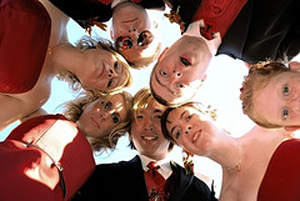 Free sample speeches for all occasions that are easy to adapt and personalize can be found at free best man speeches. Ring Bearer - Ring bearers are generally three to six years of age and boys. This is not set in stone, it can be a girl if you choose. He or she is in charge of carrying the wedding rings down the aisle, either alone or next to the flower girl. The rings are typically placed upon a pillow and the ring bearer follows the bridesmaids. I have been to weddings where there have been two bestmen and no groomsmen, no maid of honor but lots of bridemaids and not everyone has a flower girl and ring bearer. What is a wedding attendant ideal person? There isn't one, the choice is yours, don't feel you have to have any, we had a bestman as our only wedding attendant and when you are looking to have cheap wedding solutions the less attendants the less expense.